These past two weeks of training have been a bit of a slack off hence my lack of updates. I’ve been doing my long runs and I’m finding I can knock off my 10 miles quite easily now but going out for my midweek 4 and 5 mile runs are a bit of a drag and I’ve neglected them. Last night I had a really excellent long run and branched out on my rout and decided to run to my parents house which is about 10 miles away and have my dad drive me back home. It was nice to get a change of scenery but also really fun to run the 10 miles out instead of running out 5 miles and then looping back for the remaining 5 miles. These next few weeks though I’m going to get back on track with my plan and do my mid week runs as well as my long runs and then do a short tapper at the end before my half. My runners are now in dire need of replacement so I’ve picked out my birthday runners (New Balance 1080) but I don’t get to start using them until my birthday which is right before the race. Poor planning. Oh well, at least I’m getting the same pair I already have so I don’t need to get used to a different shoe and I don’t need to break them in. My long run two weeks ago was one of my worst runs in a long time. It took me 5 miles to warm up from shin splints which was the first time I’ve had them in all of my training. the next day I took my runners into the Running Den to be assessed and to try on a few different models and the salesperson told me my shoes were very worn in the centre and the soles were spreading out. I tried on the New Balance Minimus trail shoe and I absolutely love them but I wont be getting those until after my race. She suggested using the Minimus as a walking, everyday shoe at first and then if I have no problems with my feet I can slowly introduce them in my shorter runs. I really liked the look of the trail shoe but the salesperson recommended against those for non trail use as they rubber soles have carbon mixed into them to make them sticker and grippier which would cause them to wear out faster on non trail surfaces. I wish the road shoe wasn’t so ugly. Last week I picked up a bunch of different energy chews to try out as well and I liked them all a lot better then I liked my Shot Blocks that I’d been using and a lot more then gels which make me gag. 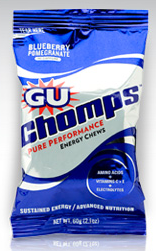 I really liked the flavour of the GU Chomps in Blueberry Pomegranate and found I got a pretty big jolt out of them. I used about 3 Chomps in my 10 mile run last night but last week I was requiring a chew per mile. I don’t feel so bad about that because Lance Armstrong did that in his New York Marathon and he’s an endurance athlete, so there. 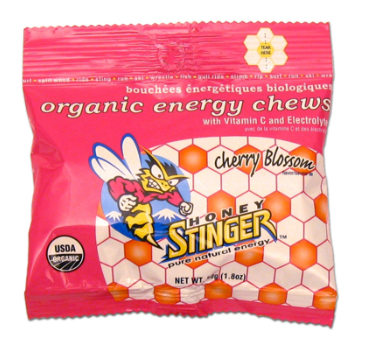 The Honey Stinger brand is my top favourite, the chews are all natural and are flavoured with honey and are much smaller and softer then any other chews I’ve tried so easier to consume during my run and that is the winning factor. I really liked the cherry flavoured ones and I have a bag of orange blossom to try next. The jolt I got from them was only slightly less then the GU Chomps but I like that if the kids get into these they’re safe for them to consume and I’m not sure that the other energy chews I’ve tried are safe for children. 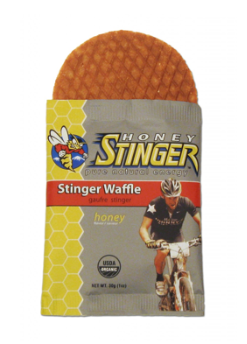 The Honey Stinger waffle is an awesome pre-run snack. I plan on taking one with me to eat before my BMO Vancouver Half Marathon in 20 days, 21 hours and 13 minutes. since I’m not used to early morning runs and a little bit worried about eating breakfast or not eating breakfast before my run but my plan is to have the waffle along with maybe a banana and a coffee on the drive over. The roads will close at 3am the night before so I think I’m going to get dropped off on the south end of the Cambie St. Bridge (where the Lulu Lab is!) and walk across. This is my first ever race so the logistics on how to get there and what happens before the race are a bit of a mystery to me. "New! Scoop Neck Dress and In A Cinch Dress"
"Fit Review ~ Energy Bra"